(Nanowerk News) Carl Zeiss recently opened a special, new measuring lab with state-of-the-art equipment in Oberkochen where it will measure micrometers and nanometers with maximum precision. As a reference lab, it is used to calibrate ZEISS measuring machines and standards, and for measurements on behalf of customers. It is also a demo room for high-end measuring technology. Under very special conditions, the specialists there work with the best measuring machines Carl Zeiss has to offer. The air temperature of the lab with its own air conditioning system must not deviate from the standard temperature of 20 degrees Celsius by more than 0.1 degree Celsius. The entire measuring lab from Carl Zeiss has been accredited by the German Calibration Service as a linear measuring center for many years. Calibration of the F25 with the multi-sphere test standard: Carl Zeiss also offers measuring services on the F25, currently the most accurate optical-contact coordinate measuring machine. This is where contact measuring is redefined. A ZEISS UPMC ultra coordinate measuring machine is used for calibration and for highly accurate measurements with uncertainty of a few tenths of a micrometer. An F25 coordinate measuring machine from Carl Zeiss is a recent addition to the lab. It is used to measure micro-system components with nanometer precision. The ultra- precise kinematics combined with the highly accurate measuring system enable measuring uncertainty of 250 nanometers at a resolution of 0.25 nanometers. For comparison, if you place a 0.25 nanometer thick object next to a human hair (0.15 millimeters) and enlarge the object to the thickness of the hair, the correspondingly enlarged hair would be 90 meters thick. Using minimal probe forces, this resolution, along with optimum control of the linear drives, enables contact measurements even in bores less than one millimeter in diameter. Optical measurements are also possible with the F25. The ViScan® camera sensor from the standard program, combined with an objective lens based on those used in ZEISS microscopy, is used as an optical sensor for 2D measurements. These optics, which have been optimized for depth of field and have minimized distortion, ensure accurate measuring results with maximum resolution in reflected and transmitted light. A Surfcom 5000 with a laser interferometric stylus- and-arm system featuring a resolution of 0.30 nanometers is also available. In addition to customers, employees at the German National Metrology Institute (PTB) are frequent visitors to Oberkochen. The metrology specialists at Carl Zeiss have long worked with the PTB. They are currently cooperating on verifying the capabilities of the F25 coordinate measuring machine. As an independent organization, the PTB used reference standards to fully confirm the accuracy specifications for the measurement of micro-parts. With this measuring machine, Carl Zeiss breaks the magic barrier in contact measuring technology of 0.1 micrometers. In other words: Carl Zeiss already uses probes to measure in dimensions clearly below 100 nanometers. To calibrate measuring machines, Carl Zeiss has also developed its own standards that are affiliated with the national standards of the PTB. For example, the multi-sphere test standard for the F25 is an in-house development. It is included with delivery. It ensures that the F25 always measures exactly. After all, micro-parts such as the tiny components for medical devices such as dental drills and saline drips or parts for car injection systems must work with extreme reliability. 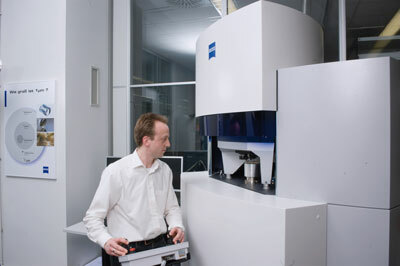 Carl Zeiss has also developed the reference standard for industrial computed tomography – Metrotomography®. For example, the multi-sphere reference rods for the METROTOM® computer tomograph are calibrated on the UPMC ultra high-end measuring machine.